Welcome to the PAYDAY 2 Tournament! Do you feel like Death Wish isn’t difficult enough? Are you looking to prove that your crew is the very best? Then you and your crew should sign up, beat the clock, get the best time and get rich! Together with the fine folks at DreamHack, we at OVERKILL are traveling across the globe to find the very best heisters out there. 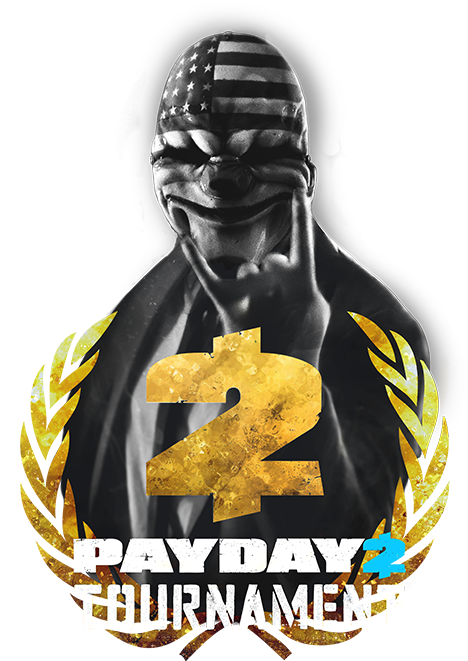 At various events across the globe, we will be hosting PAYDAY 2 tournaments for you to join. All you have to do is beat the tournament version of the heist and hope that nobody is faster than you and your crew. The reward is a cash prize for you and your crew to share. The idea behind having PAYDAY 2 Tournaments came about after the community successfully unlocked a $250,000 prize pool via the PAYDAY 2 Spring Break event. We've met some of RPR before at previous tournaments, and this time they take the new record with a time of 14:39! Well done guys! KAPPA-Z had the pleasure of winning all three days of the competition and won the biggest loot ever in PAYDAY Tournament history – a total of $30.000! We’ve met some of them before, and they completed Day 2 of Hoxton’s Breakout in only 14:58. Happy to see you guys again, and congratulations on the big loot! Endless Gaming are a group of guys we've never met before. But they came in, and more or less dominated the Slaughterhouse Heist. These guys are serious about PAYDAY and we hope to meet them again, maybe on the next Tournament. Rustey and The Americans consists of three old winners and one new. Some of them came all the way from the states to the small town of Jönköping in Sweden. Dragging plenty of heisting experience with them. And it paid off. Happy to see that great heisters from different teams aren’t afraid to create new crews! Team J-OMG impressed us greatly at DreamHack Austin 2016 as they won not only once, but twice. They were faster than everyone else and obtained a time of 10.20. We are impressed and humble. They won a total amount of $20,000. Team Bazooka 2 Yakuza was one of two crews that got rich at DreamHack Austin in 2016. They were faster than the most and their best time clocked in at 10.26. They won a $10.000 cash prize and their names will forever be imprinted in PAYDAY 2 Tournament history. Team Solkräm Mid set the first record at DreamHack Jönköping in 2015 with 10:55 on the clock on the tournament version of the Slaughterhouse heist. Team Solkräm Mid received a $750 cash prize and the glorious fame of being one of the fastest PAYDAY crews in the world. In their honor, and for future winners of the tournaments, an in-game memorial will be inscribed with the name of the crew. Stay updated on the latest news about PAYDAY and what’s happening at OVERKILL. You will find news, fun stuff, updates and information in any of our social media channels.